It seems that Michael Phelps posting impressive times in butterfly swims away from the World Championships is re-igniting something a personal feud between him and Chad Le Clos, who has been doing a lot of trash talking (Phelps does too, on a more minor scale), already getting ready for when the two clash in the pool a year from now in the 2016 Olympics in Rio de Janeiro. Chad Le Clos, seven years younger than Phelps, was supposed to be the unchallenged ruler of the butterfly events at this point. But Phelps doesn’t want to retire, and Laszlo Cseh, someone who has missed out on a lot of gold medals because of Phelps, is still around as well. Le Clos was part of the “Phelps is getting older and is rubbish” movement in 2012, beating him by 0.07 seconds in the 200 meters butterfly race to pick up his first Olympic gold, revealing to the world how you can swim and look at where your opponents are at simultaneously. But Phelps bounced back and finished Londo with four gold medals, including in the 100 meters butterfly, beating Le Clos by 0.23 seconds in a fantastic, 51.21 swim. Fast forward to 2015. 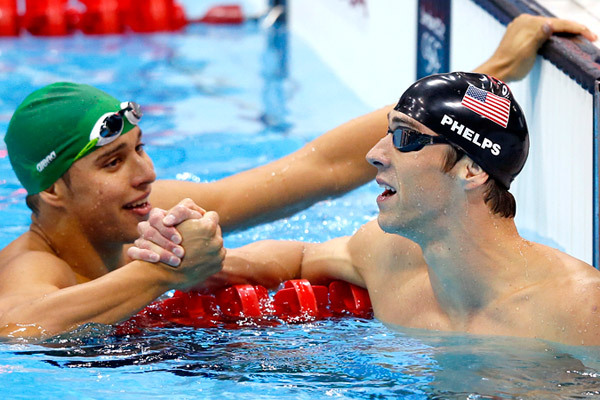 Phelps didn’t take part in the 2013 world championships, helping Le Clos cement his dominance in the butterfly with a 100-200 double. Phelps has said he’ll be back for Rio, but he was suspended for six months after being pulled over for a DUI (second time). So he’s swimming at a junior-varsity meet in Texas, and doing some incredible things. Le Clos, in Kazan, is once again back to gold and silver. He was stunned by Cseh in the 200 meters butterfly, losing by 0.20 second to the Hungarian after swimming a 1:53.68. Phelps, in the meantime, swam a 1:52.94 in Texas, the fastest by any swimmer since he set the world record in 2009 in a high-tech bodysuit. Le Clos won the gold in the 100 meters butterfly, swimming a 50.56 to set a new African record. So Phelps goes on and swims a 50.45, nearly a second faster than his gold medal-winning time at the London Olympics. I’m just very happy that he’s back to his good form, so he can’t come out and say, ‘Oh, I haven’t been training’ or all that rubbish that he’s been talking, Next year is going to be Muhammad Ali-Joe Frazier. Look, I don’t want to say it’s easy to swim by yourself, but it’s a lot harder when you know Chad Le Clos is coming back at you the last 50 meters. That’s what he’s got to think about really. Le Clos hasn’t been happy hearing from Phelps that times haven’t really improved while he was out in retirement.